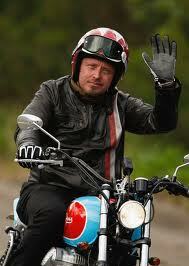 Charley Boorman is an actor, traveller and biker. In 2004 he travelled round the world on motorbikes with best friend Ewan McGregor. He entered the most dangerous race on earth, the Dakar Rally, in 2006, and reunited with Ewan in 2007 for Long Way Down, riding through Africa. Charley then went on to travel from Ireland to Sydney in By Any Means, and from Sydney to Tokyo in Right to the Edge. Now he’s back with a brand new adventure – this time all in one country, in Extreme Frontiers: Racing Across Canada. 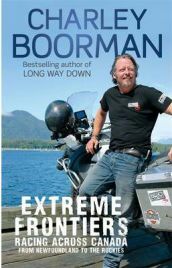 Extreme Frontiers: Racing Across Canada From Newfoundland to the Rockies is now available on book and DVD at Amazon. CBF: Charley, thank you very much for taking the time to talk to Curious Book Fans, we’re big fans of yours. Tell us a little bit about Extreme Frontiers – how did the idea come about and why did you choose Canada? Charley Boorman: Ewan and I had gone through many different countries together including Canada. We travelled through the Rockies but there was a big fire so we didn’t actually get to see them due to the smoke! I always wanted to go back there as it really intrigued me. On other programmes I’ve rushed through countries without really getting to know them, this time I wanted to take my time and really explore the history and culture of a place as well as the adventurous side of things. Canada has everything I was looking for, breathtaking scenery, adventurous activities, history, culture and the people are so friendly! CBF: During the trip you climbed Mount Fable, which looked pretty tough. You wrote in the book that it was one of the best moments of your life – what was the feeling like, to have achieved something so far outside your comfort zone? Charley Boorman: The feeling was incredible. I was absolutely shitting myself but about 2,500 metres up we stopped on a ledge to have some lunch and looked out onto the Rocky Mountains. It was awe-inspiring and the views were just so beautiful. Barry Blanchard, the famous stunt man from such films as Cliffhanger took me up and was a fantastic guide. When I got to the top I felt such an enormous sense of achievement and the view really took my breath away. CBF: Ascending Mount Fable was one of the highlights of your Extreme Frontiers journey, but what other experiences or places stand out as special for you? Charley Boorman: In Newfoundland, when we went looking for an iceberg. We’d managed to convince these two fishermen to take us out on their boat hunting. We chipped off a bit of 20,000 yr old ice and stuck it in our rum and coke that evening. The stunning countryside reminded me of where I grew up in Ireland, there’s a very Celtic influence there and I felt right at home. CBF: It all started with Long Way Round, and now Extreme Frontiers is your sixth trip. If you had to pick one experience or place as the best out of everything you’ve experienced, what would it be? Or maybe there are just too many to choose from! Charley Boorman: There are definitely too many to choose from. Every place I’ve been to has been incredible in one way or another. The road of bones was amazing but Canada as a country was brilliant. There was just so much to see and do, for fans of the outdoors it’s such an amazing place to go. You can ski, mountain bike, go climbing, trek out into the wilderness and go camping…. and the people are so warm and friendly. Charley Boorman: I’d love to team up with Ewan again and work another Long Way trip. We’ve been talking about it but there’s no rush. I’m looking into doing another Extreme Frontiers trip too, Australia would be fantastic and I’m also really interested in exploring South America or China further… so you’ll just have to watch this space! No Comments on "Q&A with Charley Boorman"